Samuel Worthington Dewey, mariner, was born in Falmouth Mass., Feb. 4, 1807; son of Capt. Samuel Madon and Mercy Bacon (Hallett) Dewey; and grandson of Benoni and Sabra (Worthington) Dewey. His father was captain in the U.S. artillery during the War of 1812. Samuel moved with his parents to Boston in 1810, attended the public school, and went to sea with Captain Ashman at the age of thirteen, making the voyage to the East Indies in 1820. He was also mate of the ship Topaz, commanded the ships Messenger and Israel, and visited principal ports of Europe, South America, and the East Indies. He retired from the merchant service in 1834. He was an ardent Whig and therefore opponent of President Andrew Jackson. In 1834 the USS Constitution was lying in Charlestown harbor near Boston to be rebuilt. Its commanding officer Captain Elliott had received visits from President Jackson on many occasions and received the president's permissions to have a figurehead of Jackson carved and placed on the mast. The local area was heavily Whig and many attempts were made to derail placing the figurehead but they ended in failure. It was into this dispute that Dewey rowed one night during a rainstorm to the Constitution. He silently pulled alongside the ship and made his way on board. He cut off the head and made his way back to shore. This prank was well-received by the locals while the Department of the Navy started an investigation into who the culprit was. Dewey left for Washington, DC hoping to present the severed head to President Jackson himself. Jackson was ill however so he had to settle for a meeting with Vice-President Martin Van Buren who happened to be a family acquaintance. Van Buren was amused by the head but refused to accept it, suggesting he deliver it to Secretary of the Navy Mahlon Dickerson, who was not nearly as amused. He threatened to arrest Dewey who replied that no judge back home would find him guilty and Dickerson eventually accepted the head. The beheading of President Jackson became legendary in its time and highlighted the strife within the country between the Jacksonians and the Whigs- who saw it as just punishment for the politics and attitude of the president. 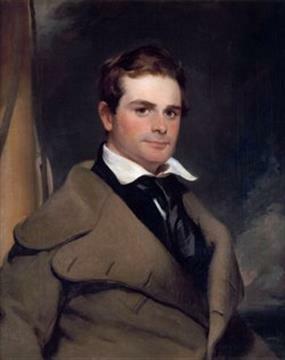 Dewey became a ship-broker in New York, engaged in trade with the southern states and the West Indies 1836-45, and while doing so publicly chastised James Gordon Bennett, Sr., founder and editor of the New York Herald, for what he perceived to be an offensive article in it. After this encounter however the two men became good friends. This led Dewey to take a bigger interest in politics and as a friend of President Polk commanded considerable influence during his administration. He invested in mineral lands in Virginia and North Carolina and while prospecting in these states to determine and locate such property he discovered in Virginia the largest American diamond ever found, which was cut and presented to James Gordon Bennett. In New Jersey he discovered the largest and finest American ruby ever found, which became the property of the Academy of Natural Sciences in Philadelphia. He became a citizen of Philadelphia in 1846 and died there June 9, 1899.